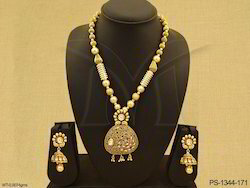 Meena kundan polki designer Necklace set. Make a style statement with this unique worked polki pendant which can be worn on any occasions from aabhushan. This pendant set embellished with stones. Earrings accompanied with it are designed similarly. keep away from moisture, chemicals and perfume and keep in our given packing. As per the diversified need of our patrons, we are devoted in proffering quality assured assortment of Peacock Pendant Set. These assortments are specially designed for its authentic design and appeal. Our quality controllers keep the fabrication under strict supervision to keep the quality as per the set quality standards. Senorita Jewellery Co. Pvt Ltd.
Our entity is actively involved in providing a wide assortment of Polki Pendant Sets that is widely well-liked in the market. These are made as per patron’s demand. We are passionately engaged in manufacturing and supplying an exclusive array of Polki Thewa Pendant Set. •Can be worn on different functions, parties, etc. We are a leading manufacturer of Polki Pendant Set.